Lindstrom was randomly selected from among those who commented on a January 2 post urging cigar enthusiasts to contact U.S. representatives and Senators to protect premium cigars from Food & Drug Administration regulation. His prize was a pair of Montecristo New York Connoisseur Edition cigars I’d received from Altadis. I must say I was flabbergasted when I saw his address. For when Lindstrom and his wife escape the cold northern clime, they can be found less than an hour north of me. Lindstrom, who goes online by his old high school nickname of Swede, sold Chevys for 32 years and worked five more as a grade school custodian before retiring. Like many of us back then, he started smoking cigarettes as a teenager, tried cigars and a pipe along the way, then quit in 1993. He returned to cigars about four years ago and said it took awhile to abandon the habit of smoking them like cigarettes. 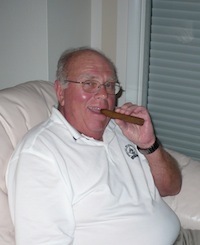 Among his favorites are Nick’s Sticks by Perdomo, the Oliva Serie O, and cigars from E.P. Carrillo. “And when I’m in Florida, the Serafin de Cuba Connecticut Robusto,” he added. As I wrote before, the contest offered us all a chance to be winners. And that’s certainly true for me. I now have another smoking buddy up the road, and I plan to see if we can get together at Arnold’s shop for a smoke before he flees the coming summer heat. Congrats and enjoy the prize, Carl. Two Montecristo New York Connoisseur Editions is a nice surprise, especially since they cost about $14 apiece. Congrats as well to StogieGuys.com for generating lots of constituent communication to senators and reps about the importance of protecting cigars from the FDA. I'm sure this contest did a lot of good. What a great way to get us smokers involved! Thanks Guy's, they were good, smoked them real slow,just a bite strong, but again good!